You’ve decided to sell your house. Congrats! This is an exciting time for you but there’s some work to be done. 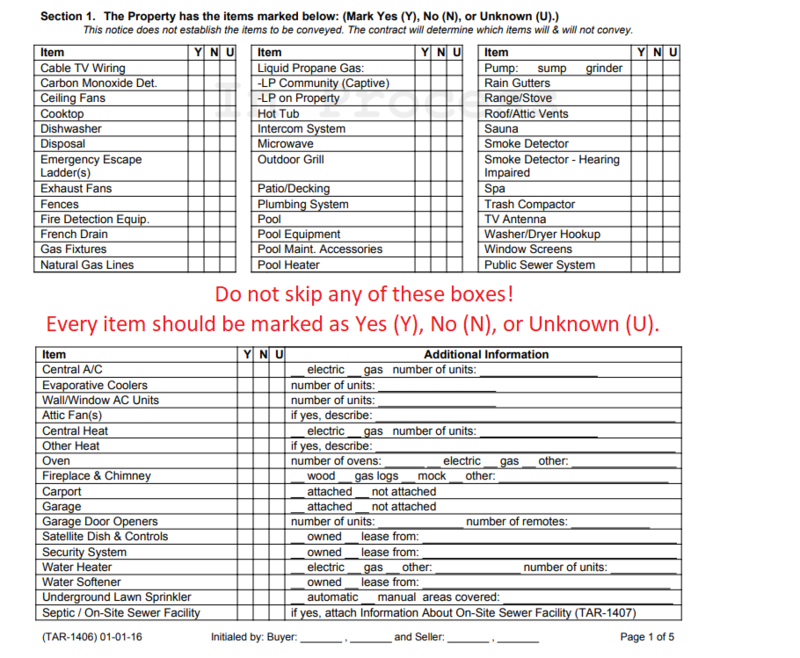 One of the first things you’ll need to do is fill out a Seller’s Disclosure Notice (SDN). Let’s dive into what a Seller’s Disclosure is and why you need to complete it. 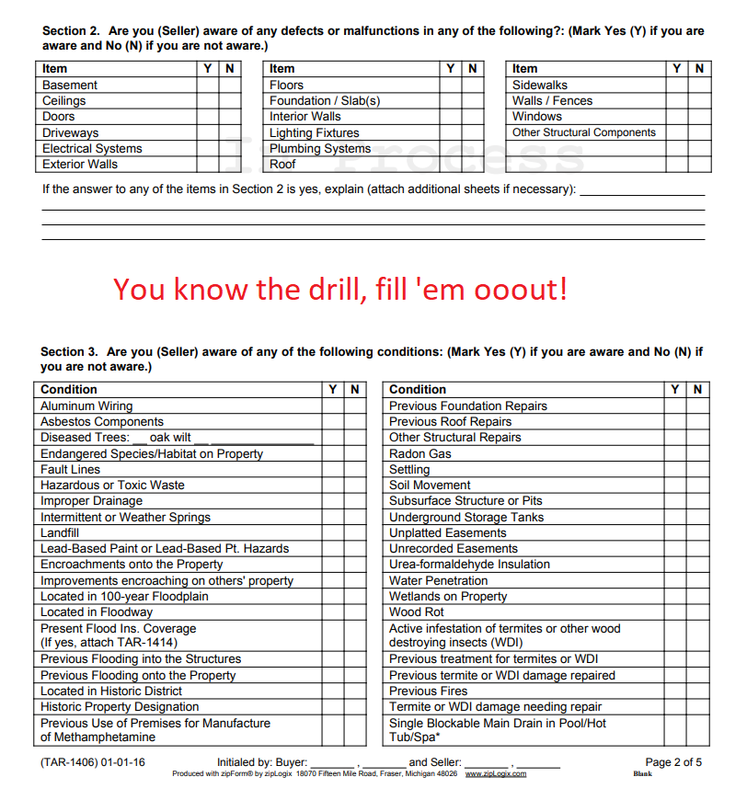 When we say “you need to” fill out your SDN, we mean that YOU as a seller must fill this out. While your agent can guide you and answer your questions about the form, they aren’t allowed to fill it out for you. 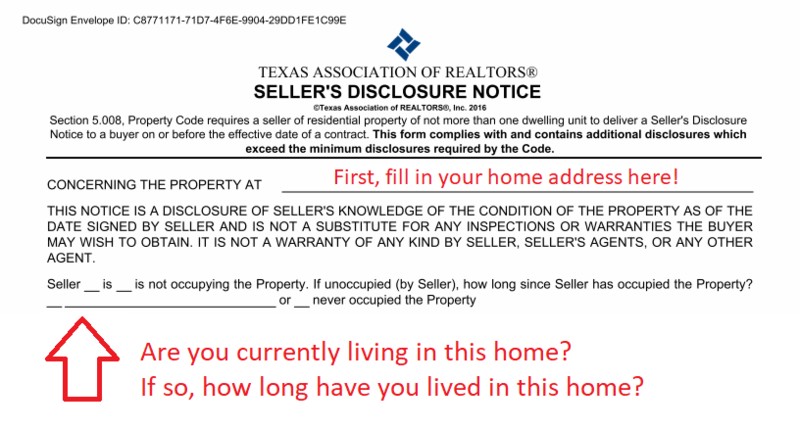 The Seller’s Disclosure Notice is required by Texas Property Code - so this isn’t just another piece of lousy paperwork that your agent is making you fill out. In the simplest terms, a Seller’s Disclosure is a document a potential buyer receives in order to know what condition the property is in. It contains about 100 questions and it will take you 20-30 minutes at most to complete. It involves lots of clicking and filling in unless you decide to do it by hand. 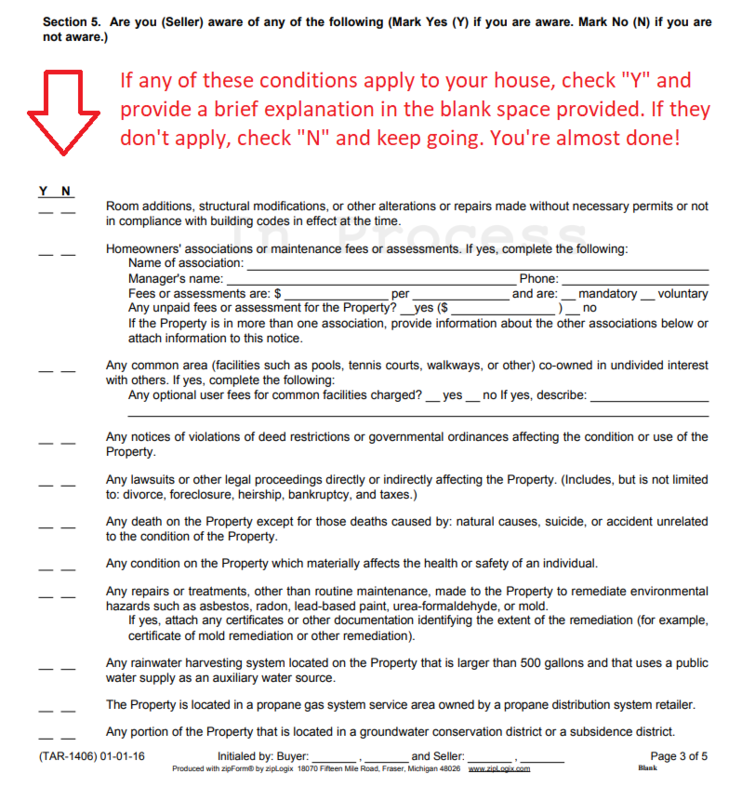 You’re not required to have this document ready until your home is under contract. Though, it’s nice to have on hand early on because prospective buyers will ask for it. The document is going to list your home’s fixtures, defects, and conditions. What in the world does that mean? Let’s break it down. Fixtures are the things that already come with the house when it is bought, like ceiling fans, a dishwasher, a washer/dryer hookup, fences, an elevator-car-garage... (we can dream, right?). PRO TIP: When you’re thinking about fixtures, it’s time to start thinking about what you want to keep from your current home, what you want to leave behind, and what will be negotiable items when you sell. Defects are things in the house that need repairs, like a hole in the ceiling, a window that doesn’t open anymore, or a door with loose hinges. If you aren’t aware of any defects, you might need to take a closer look at the details of your home. Anything that you THINK a buyer would need to know about (yes, even the smallest things) should be noted on the Seller’s Disclosure Notice. Conditions are the home’s adverse problems or special circumstances. Adverse problems can be things like diseased trees, landfill, toxic waste, soil movement, and wood rot. Special circumstances involve situations where the house is located in a historic district or has any structural repairs (like roof or foundation). Conditions also include if the property has experienced any previous fires. Here’s the best part: The form that Jovio uses for the SDN has outlined all these things in check-mark form, so you’re doing less work. Let’s move on to the form itself! The Golden Rule: Leave NOTHING blank! If you do, your agent will have to send it back to you until it’s all done. Make sure you read everything carefully and fill it out completely. Completely? Yes, completely! Don’t skip over the checkboxes! Only one person is supposed to fill out the form. Well, technically. You can do it with another person, but make sure that only one person is physically checking off the boxes and typing in (or writing down) your answers. Get ready to flip through your ownership documents, which are most likely hiding somewhere in a filing cabinet from when you first moved into the house. Fish them out of that cabinet! 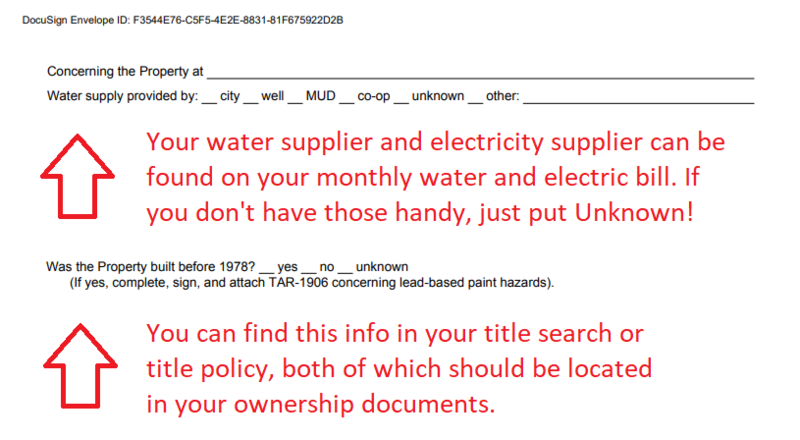 If you’ve had any previous inspections, you’ll want to make sure that you’re referencing those while you fill out the Seller’s Disclosure Notice. Past inspections will help you make sure your I’s are dotted and T’s are crossed. Don’t take it too seriously, you’ll only stress yourself out. Remember, your agent is always there to answer questions and provide guidance (in fact, Jovio Real Estate Specialists can walk you through this form in person if you so desire!). If you think there’s something that should go on the SDN, note it on there. It won’t do you any harm to disclose more rather than less. Yes, we mean it! Don’t skip over those boxes. If you don’t know this information, then simply check off the “U” for “Unknown.” Legally, if you don’t know, you can put that you don’t know. Just make sure no items are left incomplete. Visit the county recorder’s office. Look at your home’s architectural design. Search for dates on the walls of your basement and attic, or even inside the toilet tank (hey, you never know, right?). Call the local historical society. For section 5, it is especially crucial that you do not leave anything blank. This section is one of the biggest reasons that agents send back seller’s disclosures. Make sure you answer “Y” or “N” for every single question. Try to be as precise as you can. You might be looking at this sentence wondering “Umm, what? What’s a survey?” A survey is a map of your house located in your owner documents. You likely received a survey when you first purchased your home. If you can’t find it, you can order it from a Title Company. However, keep in mind that ordering and receiving a survey can take about two weeks. This will go hand in hand with your T-47 form, which confirms the accuracy of your survey and states that no updates were made to the property since the last survey was created. The T-47 is where ANY additions to the survey come into play. These are where things like a pool, a fence, or any other alterations to the property should be noted. The rest of the form is less tedious and easier to complete, so once you’ve completed section 7- section 11, you’re all ready to sign away where it says “Signature of Seller.” Make sure you leave the signature slots empty on the bottom, as those are meant for the buyer. Oh, and be sure to fill out the providers list. Then… *drum roll* YOU’RE DONE! Woo, give yourself a pat on the back. Get your partner to pat you on the back. Get your dog to pat you on the back. You did it, all the pats on all the backs! If you still need help, there's a sample form for you to reference here and you can also comment your questions down below. 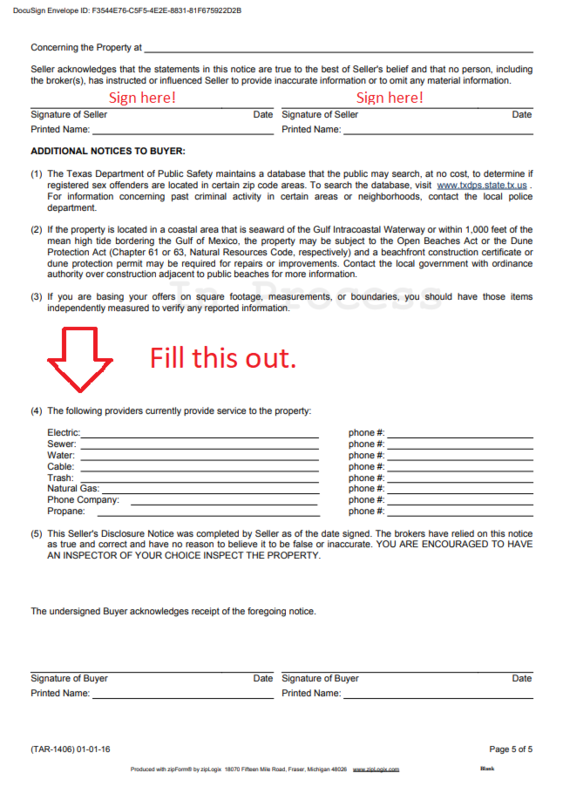 PLUS, a Jovio Real Estate Specialist can help you fill out this form in person before your house goes on the market. We got your back (and we can pat it, too! ).